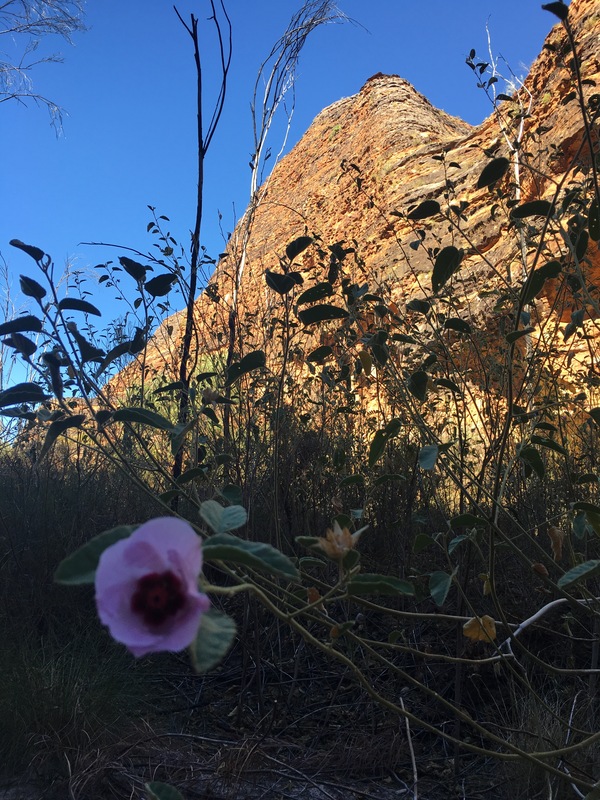 We said farewell to the Gibb and headed toward Fitzroy Crossing stopping along the way at Tunnel Creek where we traded the thongs for our shoes and headed into the cave. As we made the walk we saw people coming out that had seen a couple of freshwater crocs on the way and we’d hoped to see the same but I think we came just at the end of peak-hour and they’d been scared away. 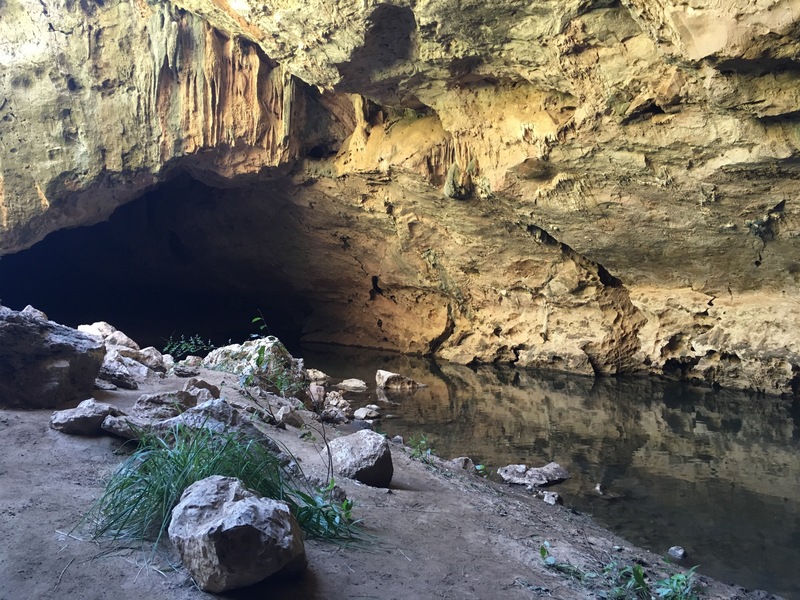 The cave was pretty cool – both figuratively and literally and the rock formations looked weird and wonderful by the torchlight. Walking through the cave you forgot that it was a warm and sunny 34 degrees outside until you got to the other end. 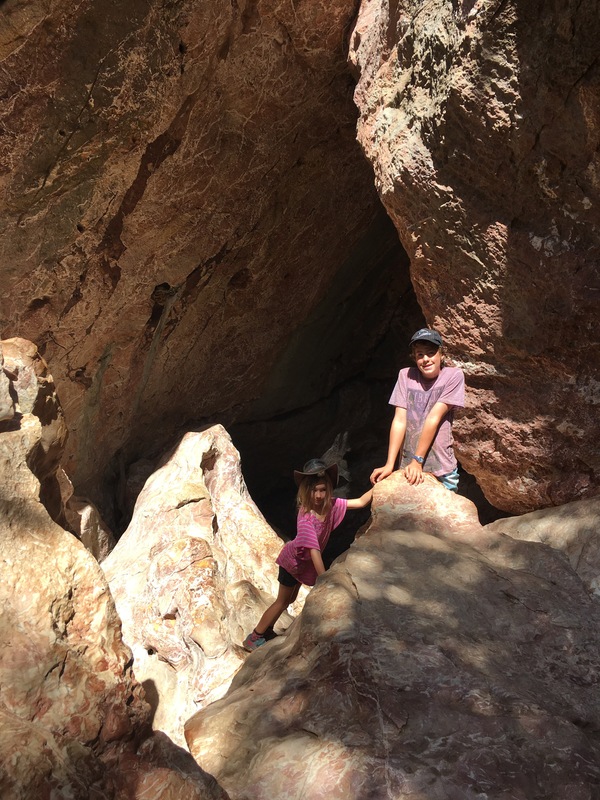 Not content with missing a croc sighting, the kids and I continued to walk further up the creek once the tunnel ended but with no luck. The kids took off their shoes and walked bare foot on the way back and we got in the car and headed to the end of the Leopold Downs Road. 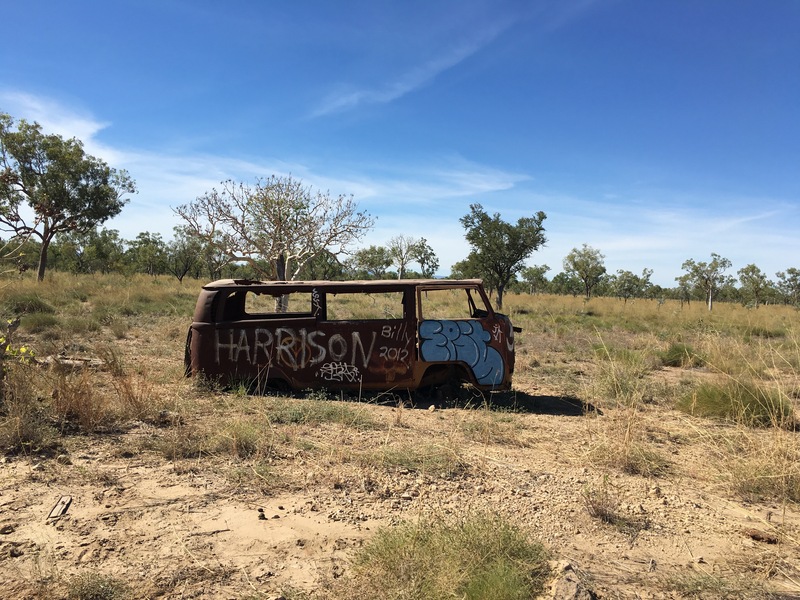 It was here that we farewelled the dirt and corrugations after 13 nights/14 days and traded red dirt for some lush green grass when we hit Fitzroy Crossing. 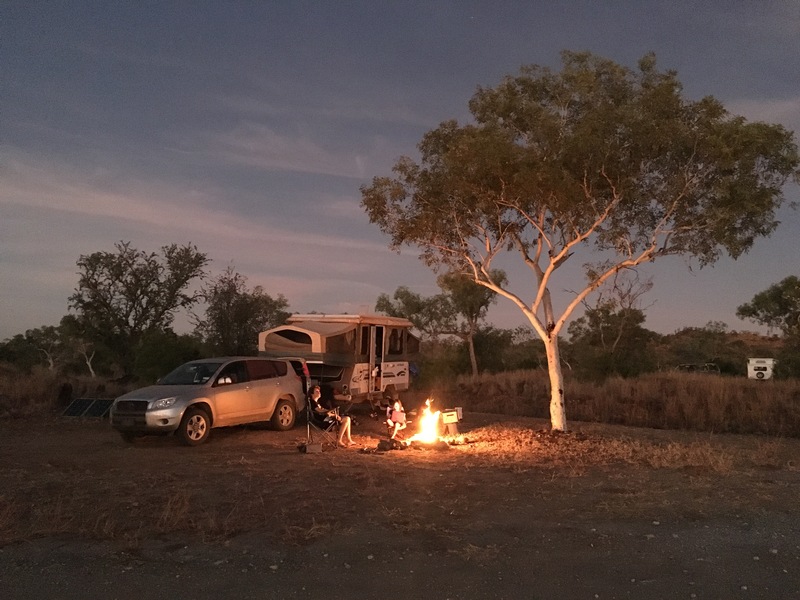 By the time we popped into the local hardware store to say g’day to my Dad’s mate, we’d missed a powered site when we checked into the caravan park so it was another night of dim caravan lights. I did manage to do a load of washing in the vain attempt of washing some of the Gibb River red from our clothes before we headed to the pub for a cold beer and some fish and chips. The fish and chip deal was supposed to be take-away but there was a Collingwood match on the TV – the first we’d seen in weeks – so we sat down to eat and watch the game. The next morning I was up early to put our laundry in the dryer and our shoes that were still wet from Tunnel Creek. 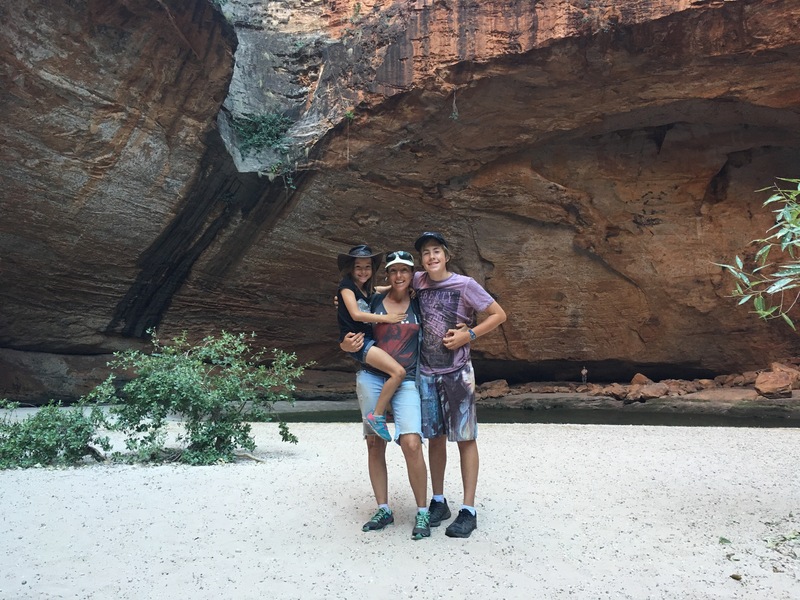 We headed off and made our way to Halls Creek for a fuel stop and to book a couple of nights at the Bungle Bungles. 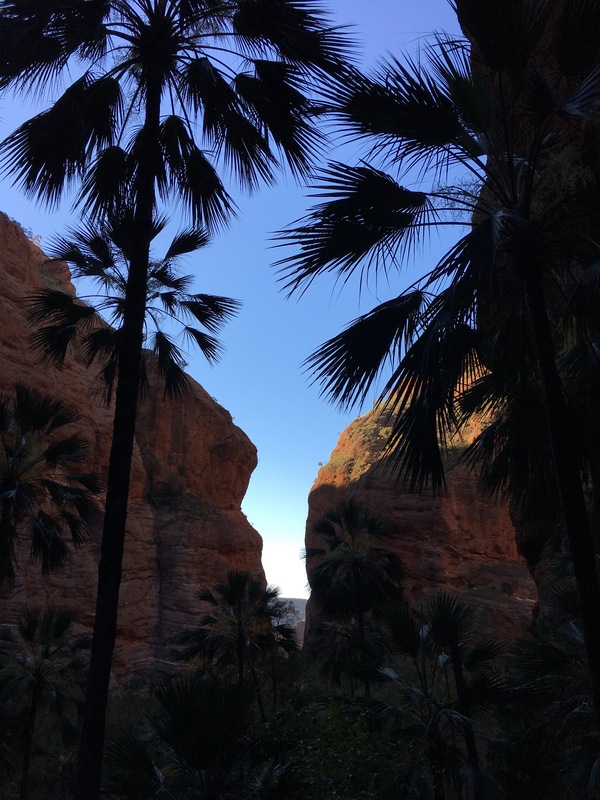 We thought we’d be able to get into the Bungle Bungles that afternoon but apparently we still had another three hours driving to do so we stopped overnight at Leycester’s rest stop. 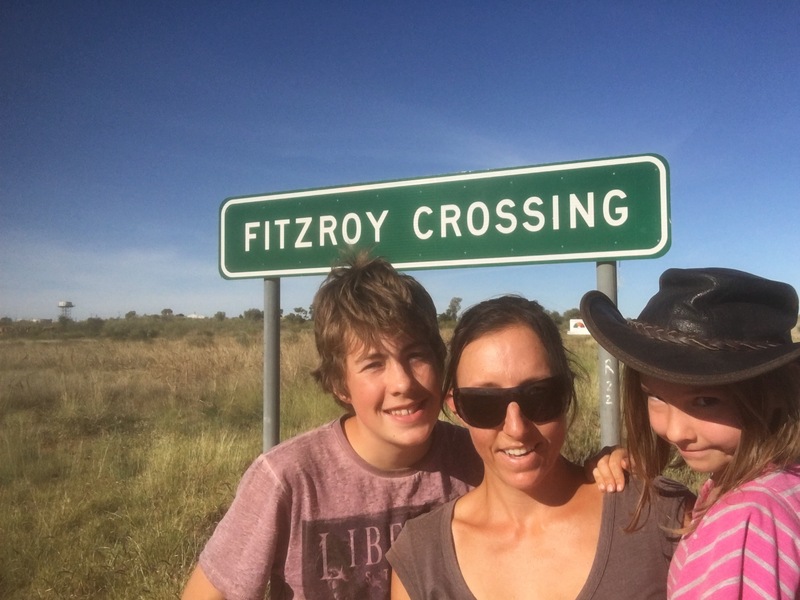 The stop was named after a young local boy killed in a car accident near the Ord River and we read the dedication to him and wanted to leave a 5cent piece at the sign (he collected them as a boy) but I had none in my purse. We were able to light a fire here so I sent the kids off to find some firewood while I finished setting up. They didn’t find much but Master14 did find a dead fallen tree nearby but the branches were too big for him to break on his own. I decided it might be time to get out the chainsaw that I’d bought at the Caravan and Camping Show before I left. I put on my safety goggles and started to cut up the big tree branches and trunk. 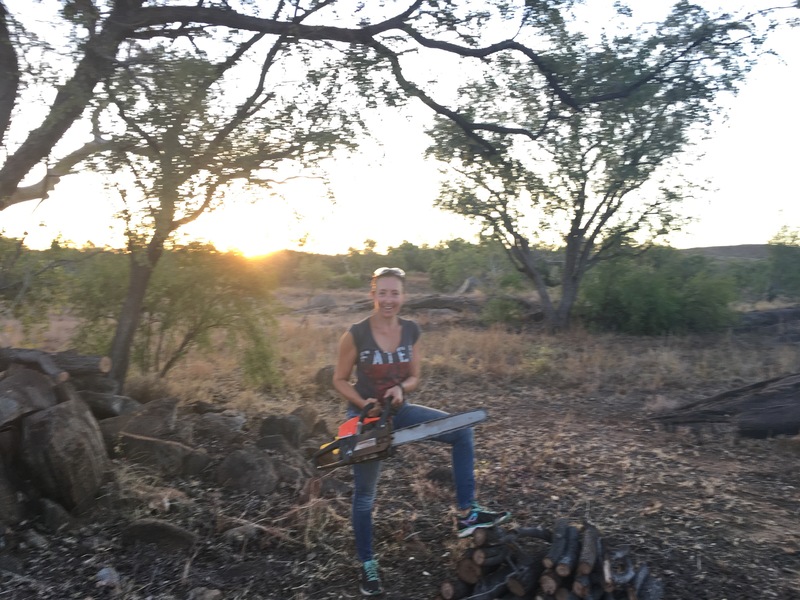 Miss6 was off crying in the van and I thought that the loud noise may have scared her – turns out she was upset that I’d cut the tree up and cut it away from it’s ‘family’ (there were a couple of trees all growing together where this dead tree had also grown) she’s such a nature lover. She soon forgot her mourning of the tree when we were around the fire and fell asleep on the camp chair. Up early the next morning and off to the Bungle Bungles. 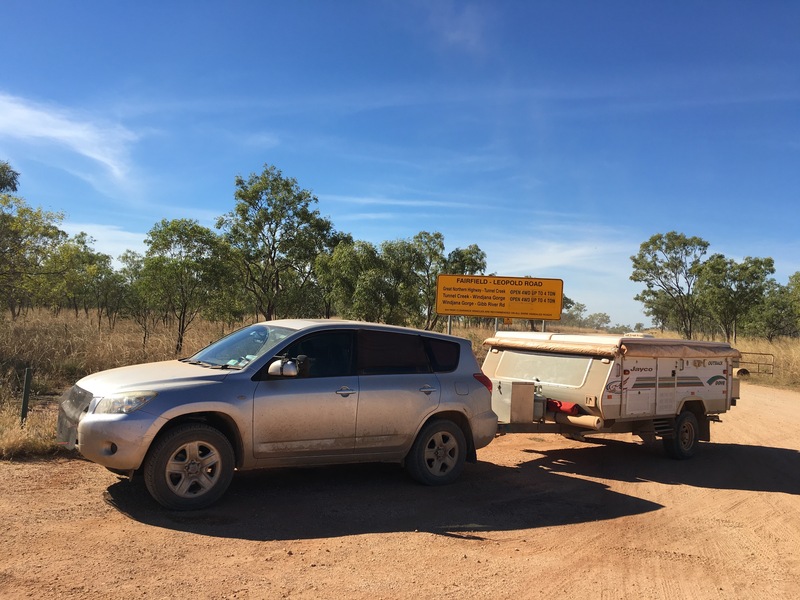 The lady at the information centre in Halls Creek told me the 56km drive would take me two hours – when we hit the dirt road I thought to myself ‘I’ve done the Gibb – there’s no way this will take two hours!’. I let some air out of the tyres and started the drive along the straight dirt road. 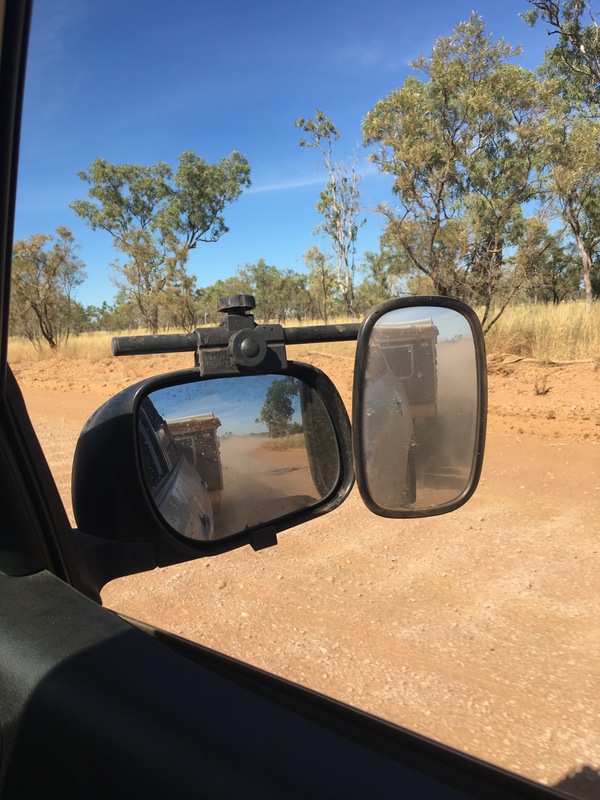 It wasn’t long before the road became windy and then hilly and then both – the tight curves, corrugations and steep climbs very quickly made the two hour drive more realistic and officially the worst of the roads that we’d driven on so far. Once at our campground though, the dirt roads were flat and in good condition – like a reward for making it through the entrance road. 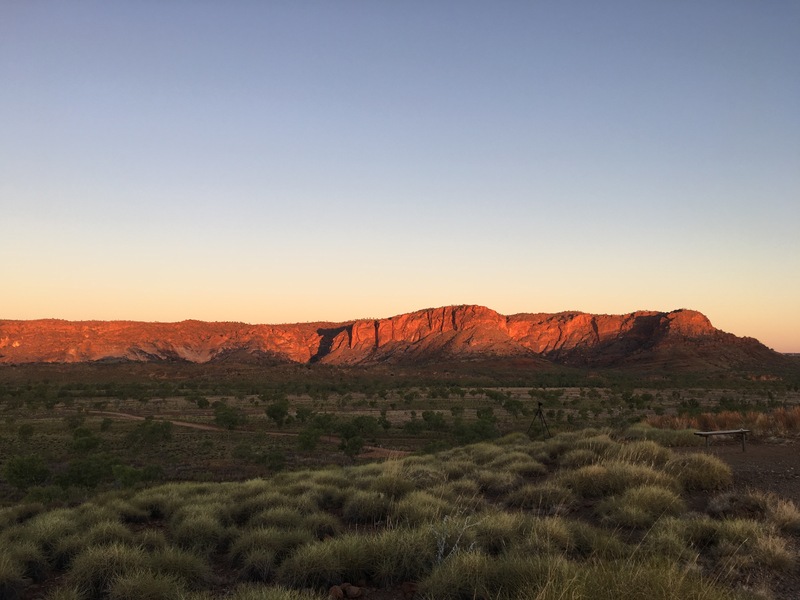 After setting up camp we headed to the Echidna Chasm in the hopes of catching the midday light at the end of the walk. We bumped into the family we’d met all those weeks ago at Wilpena Pound as we walked into the chasm. 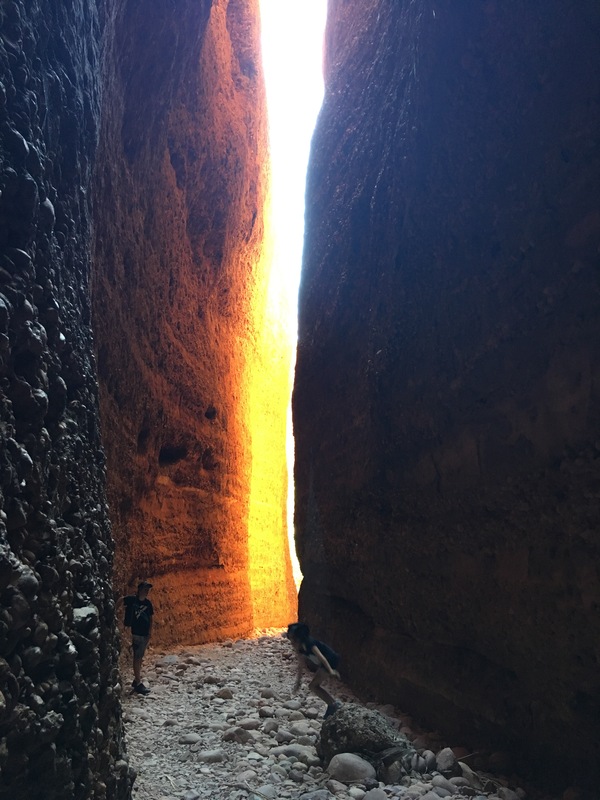 We missed the ideal time to see the light in the chasm but it was still a beautiful sight to see. The kids enjoyed climbing the walls like spiderman while I made some Indiana Jones closing walls references that made a nearby older guy laugh and went straight over the kids heads (note to self: get kids to watch Indiana Jones movies when we get home). 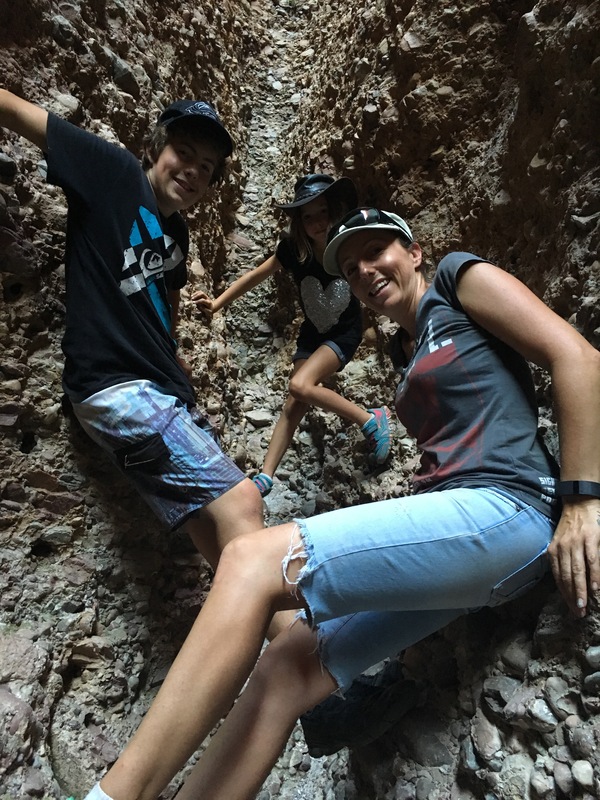 After Echidna Chasm we decided to head to Blackwoods to do the Mini Palm Gorge walk but I hadn’t packed lunch so we detoured via the van first before we could begin the 2-3 hour walk. I didn’t think we’d be able to finish the walk as we didn’t start it until 2.45pm and I didn’t want to be walking in the dark so I told the kids we’d just walk for a bit then turn around and go back. This was a challenge they took on with gusto and we ended up making it all the way to the platform at the end in only 45 minutes. 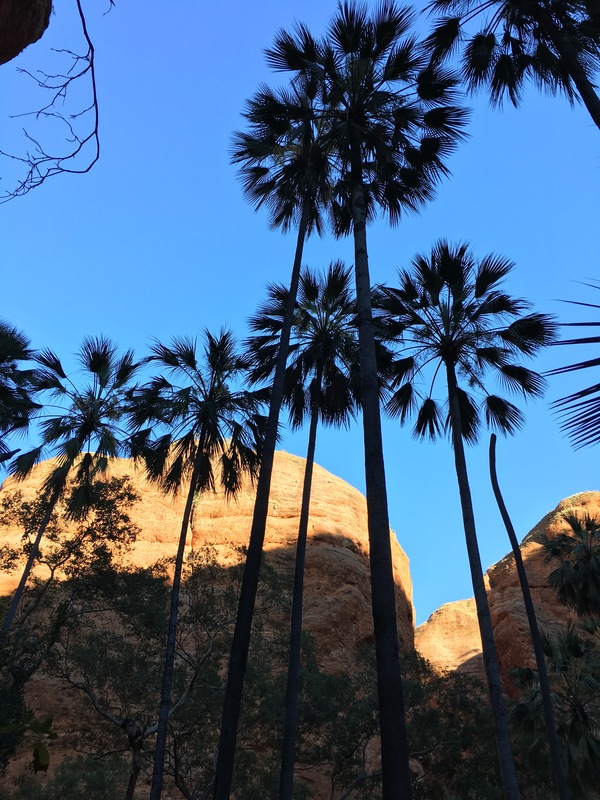 The final two-thirds of the walk were on rock with the last third being the most rugged, interesting and picturesque – dotted with tall palms among the red rocky walls of the mountain range. It also smelt of pine and reminded me of Christmas as the soft cool breeze blew (this analagy confused Miss6 who failed to see how a gorge could be like Christmas!). I set the kids the challenge to beat their time on the way out and they rose to it with great enthusiasm making it back to the car in under 40 minutes. 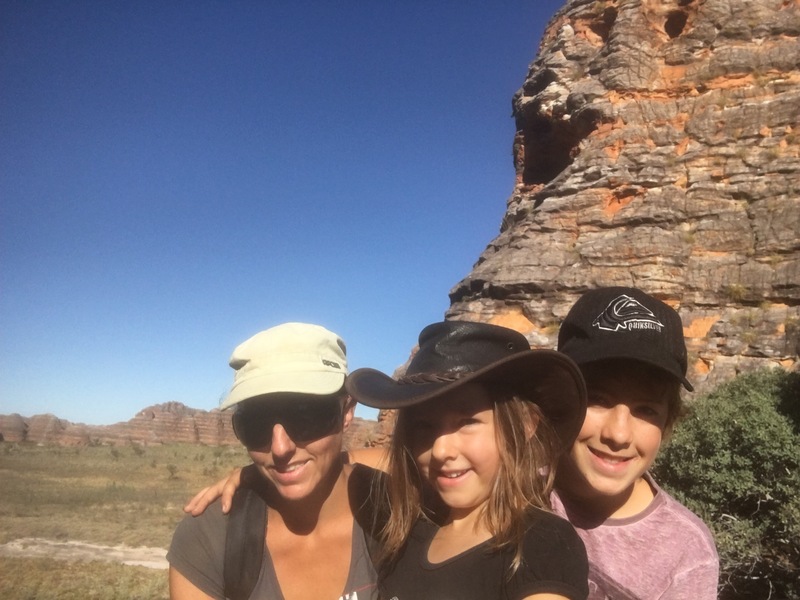 We had enough time to head to the sunset lookout and climb the steep 500mtr pathway to the lookout where we not only got some random phone service as my phone went off on the climb, but we bumped into another family that we’d met at Mount Barnett along the Gibb. We chatted as we took some photos and generally enjoyed the views. The colours over the mountain range were reminiscent of those at Uluru. 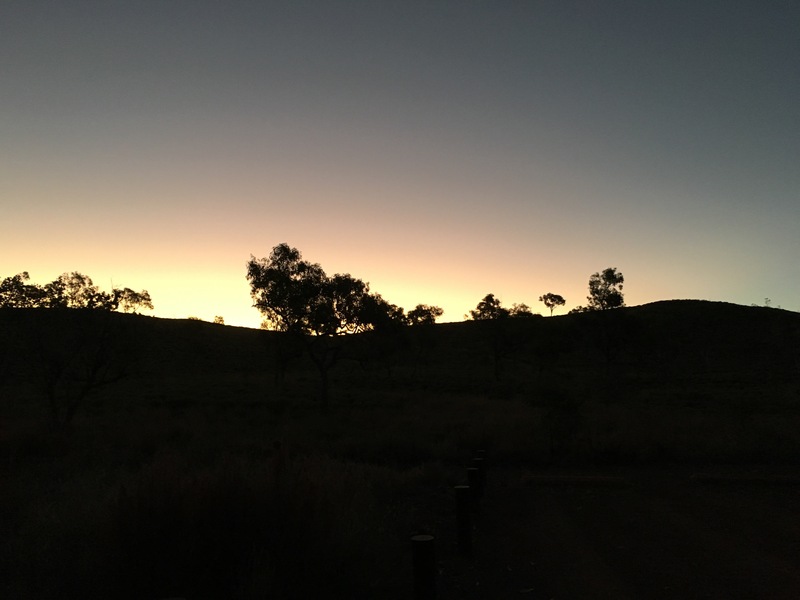 Sunsets seem so vivacious in the Kimberley and also throughout the McDonnell Ranges with their red and orange and yellow but then a soft hue of purples and pinks over rugged mountain ranges. The colours and mood were just lovely to witness and a great precurser to a lovely starry night dotted with soft, warm breezes. The next morning we were off by 6.45am to get to Picaninny Gorge to do a few of the walks here before it got too hot. 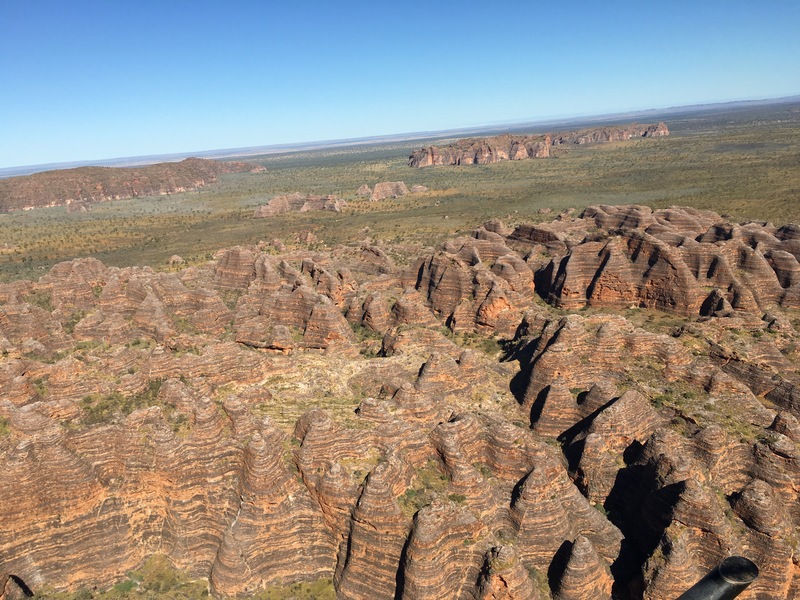 We started with the Picaninny Creek walk which had some spectacular views of the dome shapes of the vast Bungle Bungle Ranges – they are so huge that we pondered their size against that of Uluru. 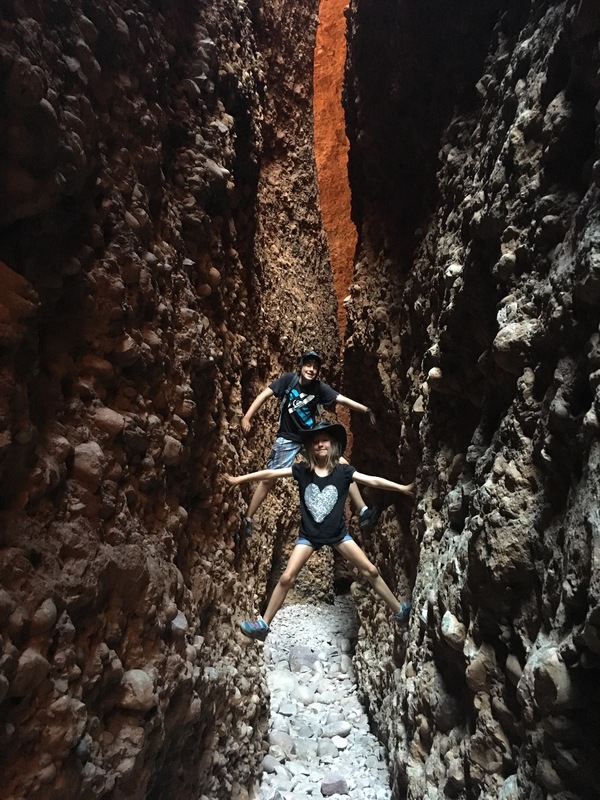 Next we headed to the Cathedral Gorge walk. Walking through the high walled pathways along the creek, there were remnants of the wet season with some waterholes with fish and a few dead frogs. 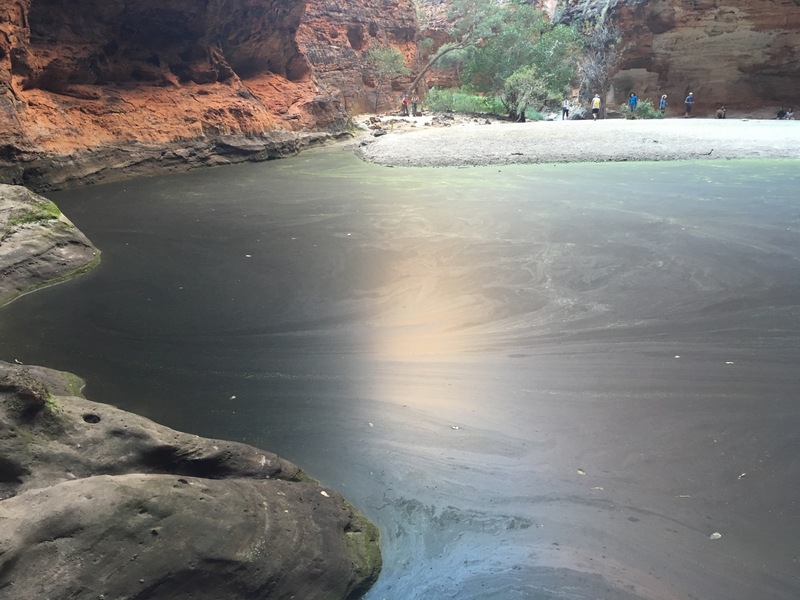 We arrived at Cathedral Gorge to find a very green body of water surrounded by a sandy bank to one side and rocks to the other. The high walls have traces of waterfalls during the wet and the entire space feels quite serene. Even the green body of water is pretty with its marbled patterns across the surface. 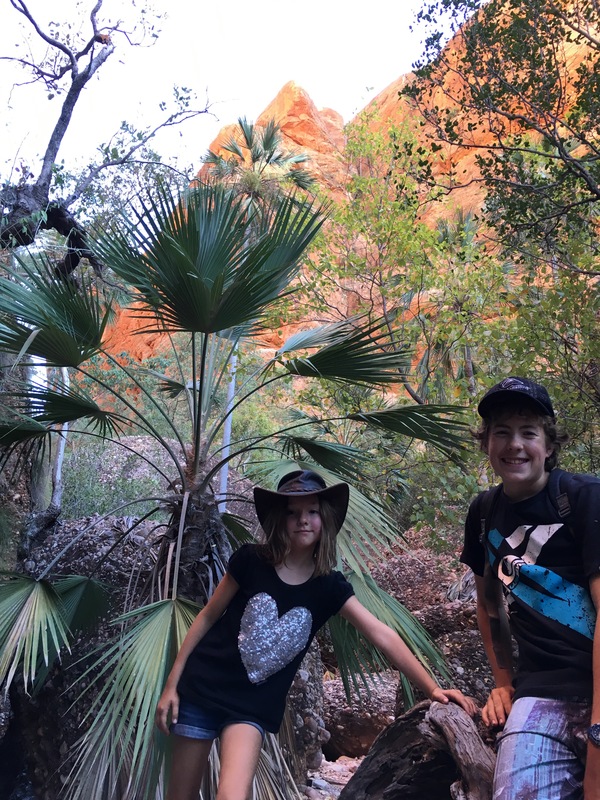 Shortly after we’d arrived, a tour group arrived and Miss6 managed to make friends with one of the tour guides and ended up walking with her chatting about our holiday as we all walked back toward the carpark via another short loop walk. On the drive back to camp we made a quick stop at the airstrip to see how much a helicopter ride would be for us. 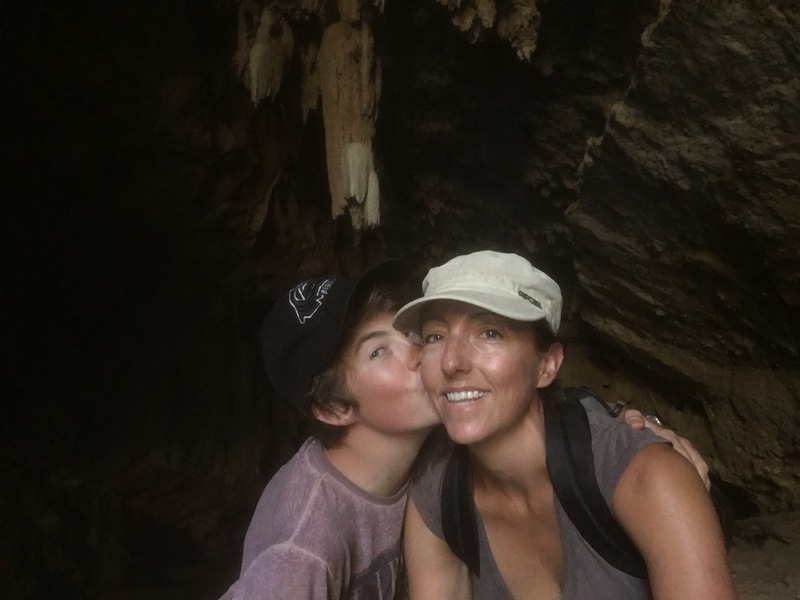 As the kids had a combined weight of less than 77kg they were allowed to book one seat to share so we booked a spot on the 1.30pm flight which gave us enough time to drive back to camp, have some lunch, grab my over-used credit card and get back. 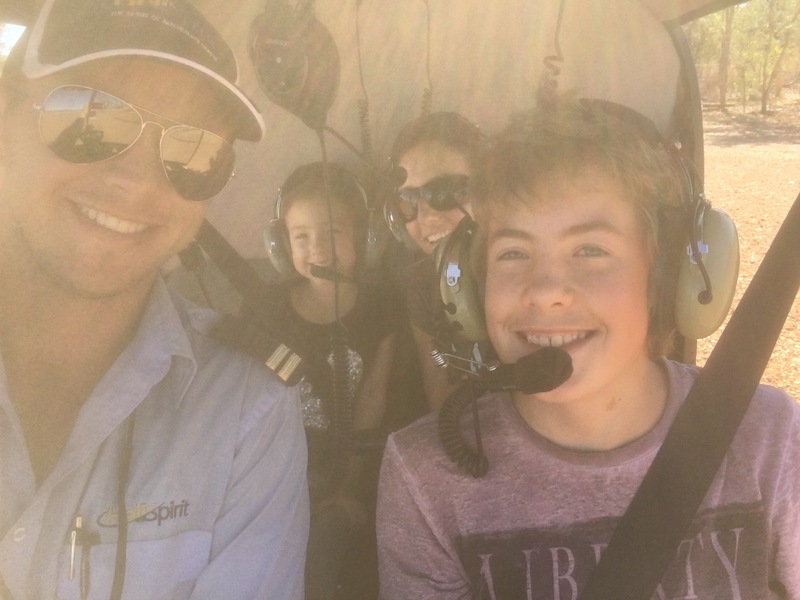 Nobody else had booked a flight at that time so the kids got to have their own seat with Master14 up front with the pilot and Miss6 and I in the back. We paid our fare, got our safety talk and met our pilot – all from three good looking guys in their pilot uniforms – I felt like I was on the set of a possible Top Gun sequel. 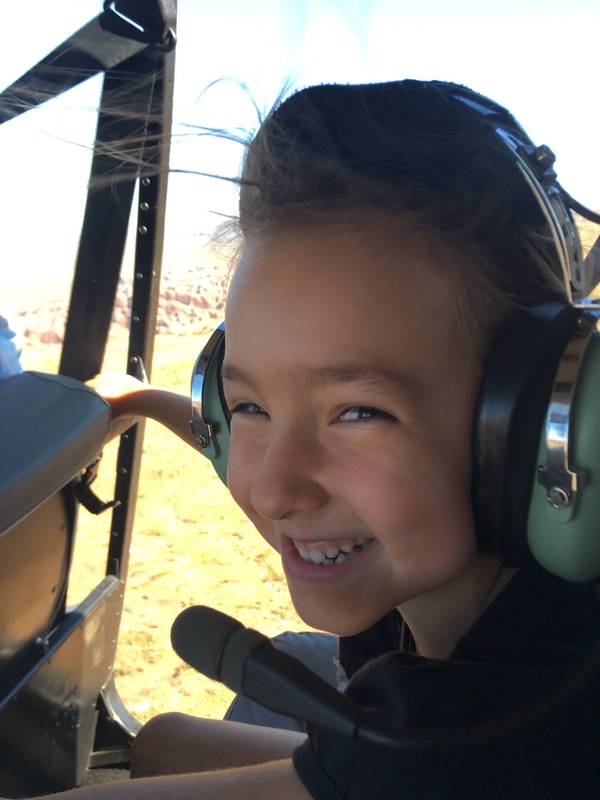 Unlike our helicopter flight over Katherine Gorge, this helicopter had no doors so it was very windy and Miss6 wasn’t scared at all – in fact, I couldn’t wipe the smile off her face! The flight was 18 minutes over the area that we’d walked through that morning. It was pretty spectacular to see the view from above and appreciate just how big it all is. 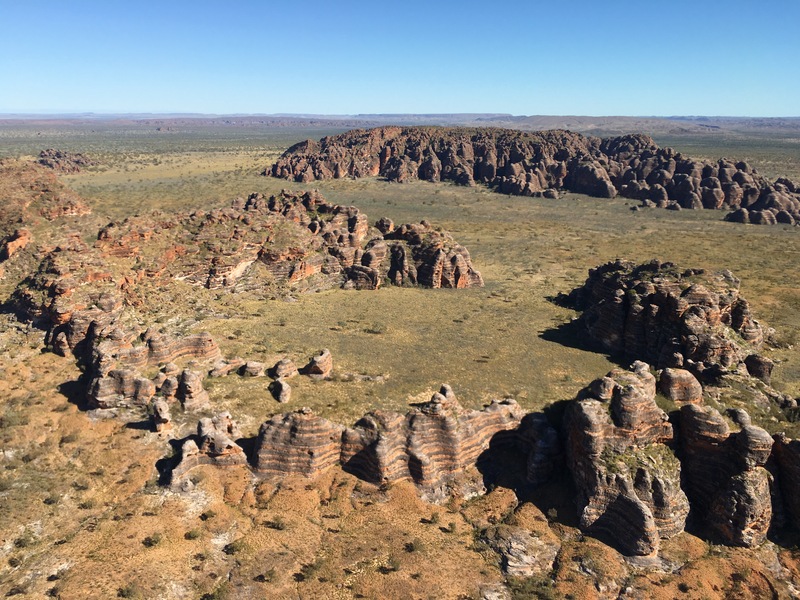 Just one section represented the same footprint as Uluru but without the height. Back to camp for a quick dip under the solar shower to feel a little fresher before we head off tomorrow for more bush camping. Before leaving home a friend asked what three things I would miss most and I’d said my bed and my friends and family (couldn’t think of a third). Turns out I’m not missing my family and friends all that much (they’re always in my heart so never far away) but I do miss running water, showering…without thongs…alone, flushing nearby toilets and being able to take the availability of a petrol station for granted.